Major General Rocky Meade, with the approval of the Defence Board, last Friday July 27, 2018, promoted one Lieutenant Colonel (Lt Col), and three Majors to the ranks of Colonel and Lieutenant Colonel respectively. The promoted officers are Colonel (Col) Winston Walcott and Lieutenant Colonels Ricardo Blidgen, Everton Morgan and Sydney Powell. Col Winston Walcott is presently the Commanding Officer of the Third Battalion the Jamaica Regiment (National Reserve). He joined the Jamaica Defence Force on June 25, 1993 and was granted a Commission in the rank of Second Lieutenant on March 28, 1994. He was promoted to his previous rank on May 13, 2012 and has served the Jamaica Defence Force in various capacities over the years. Lt Col Ricardo Blidgen is presently employed as a Company Commander in the Third Battalion The Jamaica Regiment (National Reserve). He joined the Jamaica Defence Force on June 25, 1993 and was granted a Commission in the rank of Second Lieutenant on December 3, 1995. He was promoted to rank of Major on April 29, 2012. Lt Col Everton Morgan is presently employed as a Company Commander in the Third Battalion The Jamaica Regiment (National Reserve). 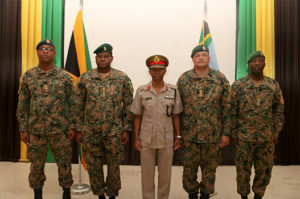 He enlisted in the Jamaica Defence Force on June 30, 1991 and was granted an indefinite Commission in the rank of Second Lieutenant on March 17, 2000. He was promoted to his previous rank of Major on October 26, 2013. Lt Col Sydney Powell is presently employed as a Medical Advisor at Headquarters Jamaica Defence Force. A former Force Medical Officer, Lt Col Powell joined the JDF in January 1998, and has served in both the Regular and Reserve Forces.